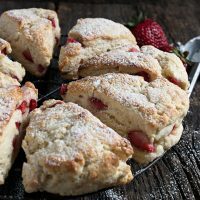 These Strawberry Cream Scones use just cream and no butter, for a lovely flavour and a and moist texture. These ones are filled with lots of fresh strawberries, so they are perfect for a strawberry season treat! Did you get up to watch the Royal Wedding this past weekend? I can never resist them! This was the third I’ve watched (yes, I’m old enough to have watched Diana and Charles get married :) I have to say, this one was my favourite – the most personal. For the royal wedding watching, I baked up some cream scones and bought some clotted cream. They were so delicious that I was inspired to bake up another batch this past weekend, this time with some strawberries. I know many of you are into strawberry season already (jealous!) 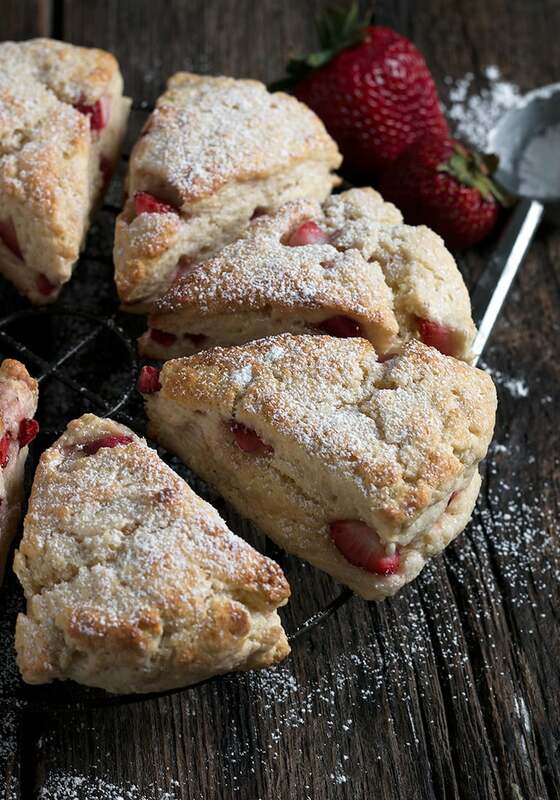 and I can’t think of a nicer way to bake with beautiful strawberries than to pair them with cream scones. Cream scones are scones that are made with only with heavy cream as the fat and use no butter. Since the heavy (whipping) cream is providing all the fat in these scones, you really can’t substitute a lesser fat cream or milk and achieve the same flavour and texture. Adjust the amount of sugar you add to the scone to your taste. As written, they are definitely not overly sweet. Try them as written, then adjust up or down as you like. If using imported, out of season strawberries, I like to add a teaspoon or two of sugar to the diced strawberries along with the flour. Change it up by trying these scones with other fruit, such as raspberries, blueberries or blackberries. For best results, don’t skip the trip to the freezer before baking. The brief cooling helps the scones rise higher and keep their shape better as they bake. Top Tip: Every time I make these scones I end up using a slightly different amount of cream. Flour varies in humidity, so on one day, the flour will absorb more liquid than on a drier day or with a different batch of flour. So when it comes to the amount of cream to use, you’ll want to add as much as is needed to make a just moist dough (with no patches of dry flour at the bottom of the bowl.) That may end up being a bit more (or less) than the recipe specifies. 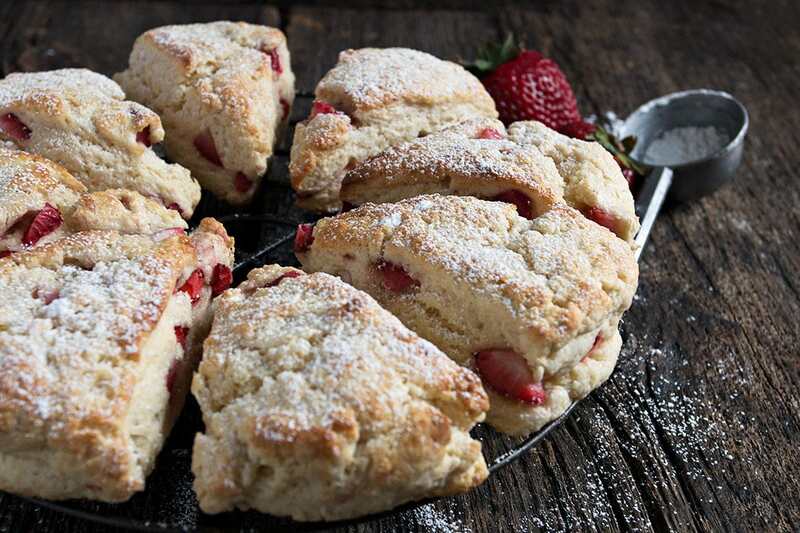 Classic cream scones, filled with chunks of fresh strawberries. Preheat the oven to 425°F. Line a baking sheet with parchment paper and set aside. Prepare the strawberries and place into a bowl. Toss with a bit of flour (just a couple of teaspoons) and set aside. *Note, if using imported, out of season strawberries, I like to add a teaspoon or so of sugar, as well. Whisk together the flour, baking powder, salt and sugar in a large bowl. Measure out the heavy cream, then stir in the vanilla. Pour half of the cream over the dry ingredients, then stirring gently while adding just enough of the rest of the heavy cream to make a just moist dough. There shouldn't be any pockets of dry flour in the bottom of the bowl, but the dough shouldn't be super sticky, either. 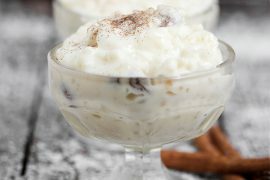 Don't hesitate to add an additional tablespoon or so of heavy cream if needed to achieve this. Gently and quickly stir in the strawberries. Remove the dough to a lightly floured work surface. Gently gather the dough into a rough ball, then using the palms of your hands, gently press into a 7-inch round, even-height circle. (Press in along the sides, as well, to ensure the sides are not crumbly). Transfer round to prepared baking sheet. Using a sharp knife, cut the round into 8 even wedges. Separate the wedges and arrange on baking sheet with at least 1 inch in between. Place baking sheet into the freezer for 15 minutes. Remove from freezer and brush tops of wedges with heavy cream. 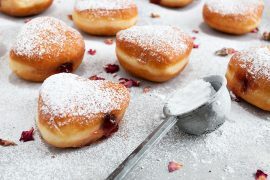 Sprinkle tops generously with white, granulated sugar. Work quickly so they don't warm up. Bake the chilled scones in preheated oven for 14-16 minutes, or until lightly golden. 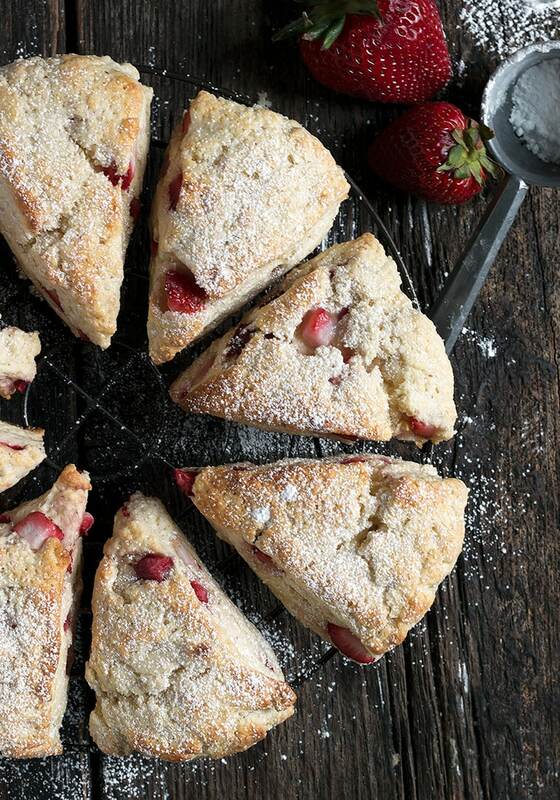 Remove the scones from the oven and immediately remove to a cooling rack. Serve warm or store cooled scones in an airtight at room temperature for several days. These scones can also be frozen for longer storage. These were delicious. I used more cream than the recipe called for and cooked longer (about 7 minutes or so). The scones stay moist and keep well. My husband even liked them which is unheard of. I plan to make it again trying blueberries and maybe some slivered almonds on the top. Regarding the sugar at the end, I used granulated but it doesn’t show so next time I’ll use powdered. Thank you for the great recipe! Oh thanks for the tip about the sugar. I have to tell you, my husband asked if I was going to eat the last scone last night and when I said he could have it he wolfed it down. So in total he ate three scones, my friend had two and I had two. Normally he won’t even try a scone because he thinks they are going to be too dry and he normally doesn’t eat any kind of leftover. He kept saying “these are so good”. Kudos to you and your recipe! Thank you for the delicious recipe. This is my first time making anything with a dough. It ended up using my nearly 2 cups of cream to get rid of all the flour pockets, but otherwise it turned out really nicely. Also they could have used 18 minutes. They were a bit too blonde. It’s a keeper! Beautiful looking scones…they have to be delicious. You know my love for scones Jennifer! 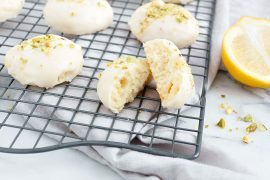 Will definitely be adding these to my baking list! These are beautiful! And so enticing. I can’t wait to get some local berries and whip up a batch! 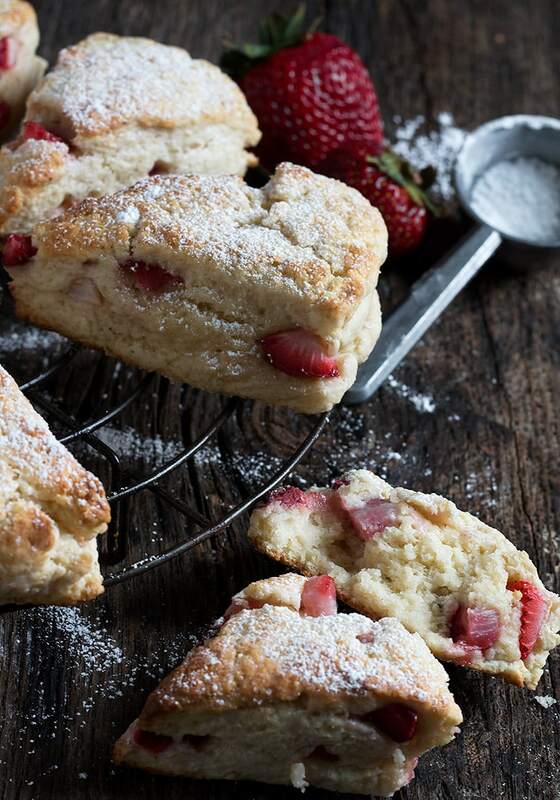 I love the idea of strawberries and cream as scones. These must be so good eaten right away! They certainly look scrumptious. These look AMAZING, so plump and juicy! !